I remember to this day the first time I was able to eat an entire cheeseburger from McDonald’s. It was kind of a big deal. My brother and I would usually get Happy Meals when we were younger, and would usually be disappointed by the toys—but nonetheless, they were still fun. The older I got, the less I would play on the train set. I also decided to change what I ate at McDonald’s. My dad would get a Big Mac, and my mom would get the Quarter Pounder with cheese. I set my sights on this. I thought I was such a big kid when I could finally finish that entire sandwich. We didn’t eat there a lot. But I’d be lying if I said when I was younger I thought I could live off of McDonald’s… But, your body grows and changes, and foods you used to hate you suddenly realize aren’t so bad—like sweet potatoes… and foods you used to live off of suddenly become your worst enemy. We watched the documentary “Super-Size Me.” For one month Morgan Spurlock ate nothing but McDonald’s food. Every meal—breakfast, lunch, and dinner. He had to eat every food on the menu at least one time, but he wasn’t allowed to eat anything other than fast food for 30 days. Before he started the experiment he went to the doctor and did several tests, a physical, making sure his body was in good shape—which it was. He was a pretty healthy man. The doctor, however, was not thrilled he was going to be doing this experiment, but stated that the body is fairly adaptable, and he would probably be able to recover quickly. The salt content put on the food makes them mold-resistant. Other tiny microorganisms won’t go near that kind of food—so it will not break down. It will not decompose. It becomes an everlasting French fry. It could survive nuclear war, it will live forever. It will always stay the same. It is endless, it will not die; it is eternal. Somewhere along the way, I thought this was what my faith was supposed to look like. That, having faith in Jesus, believing in God would keep me from dying spiritually, I would live forever. I thought I could survive whatever came my way—because God always stays the same. And, eternal life means nothing can ever be broken or painful or incomplete. Eternal life means a life that is spotless and bright and golden. Last week, we danced with the idea that maybe we are also called to be bread for one another along the journey. This week, it seems like the Spirit is asking us to consider thinking—you are what you eat. Our gospel story for today tells us ‘the Jew’s’ were around, listening to Jesus speak about being Bread from Heaven. He references manna in the desert, Moses, the law—and this shakes them a little bit. Then, he starts talking crazy talk about eating flesh—his own flesh. And, to be honest—it’s a little weird. So, we back up. We go back to the days when Moses was leading the people in the wilderness, when they were eating manna day after day after day. We go back and look through the huge list of Laws—especially the laws dealing with food. The Hebrew people were not allowed to eat pork, or shellfish, among others. When we breathe context into these statements, we understand the people at that time had no way to properly clean or cook certain foods—and were thus advised to stay away from them. If you ate too much chicken, you were considered to be scatter brained and highly excitable. So, in this sense—you are what you eat. The people of God who ate manna in the desert—the manna disappeared after the morning dew was gone. It did not stay around for very long. In the same way, the people of God were wandering around for 40 years. They did not stay put in one spot for too long—you are what you eat. So—we again hear Jesus saying, I am the bread of life. You must eat of my flesh and blood self. You are who you eat? By eating and drinking I will enter into you, and you will enter into me. Sounds a lot like the old laws—becoming what you eat, taking on the soul, the character of what you are eating… Is Jesus asking us to take on or adopt his soul in our lives? Is he asking us to live the way he lives? Whoever eats this bread will live always… We hear that and we can so easily think he is talking about the next life. But, what if he’s talking about this life today? What if he is saying, if you follow me, if you live your life the way I am living mine—you will really be living. That is the real life–that is a life where you are living at all times. That is a life where you’re not waiting for life to come; you are embracing it with each moment. We look at the everlasting French fry—with salt and preservatives caked on so much that life cannot happen… It is frozen where it is. It will stay that way; it will not change. Is this really food that will satisfy? But, we look at ordinary bread, bread that has been left out to breathe the air, be touched by human hands—and it becomes moldy. It literally gives of itself in order to sustain another life. In the kitchen we think mold—no matter what color, is gross, and disgusting. But what I am learning about bread—the more natural and pure the bread is, the more molds it will attract; the more life it attracts. 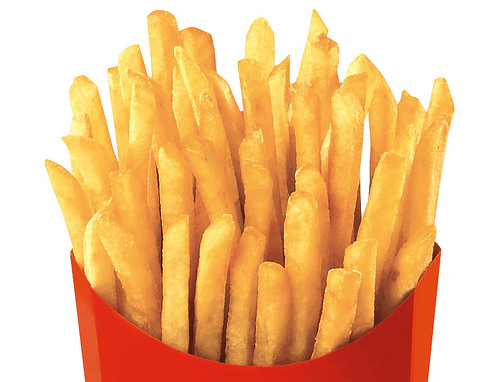 Are we living our lives as a community of Everlasting French Fries? Have we dumped our worship full of preservatives—that extra stuff that keeps out the real mold of life? Are we covering ourselves with additives so that we don’t have to face the fungus and growth of the people and world around us? Or, are we willing to be bread—real bread, bread from heaven. Are we willing to follow where the Spirit is leading, to the mold, to life that is growing even in less than ideal conditions? Are we willing to be always living—embracing life as it comes to us… even if that means we find mold on ourselves? Mold can be blue, and white, and black. It can be spotted, or blotchy, fuzzy or not. It can be…fragrant… But, nevertheless, it is life. And it is the kind of life that often gets overlooked, and thrown out. And we will often do whatever we can to avoid it all together. But mold is real, and it is pure. When we embrace this life, we will find life within us. The Spirit of God moves and breathes within us, all of us. Calling us, inviting us away from a life lived as Everlasting French Fries—called and invited instead to be living always. It’s not glamorous, it’s kind of messy. But it is real, and it is lasting—and this—this is eternal life.